There are so many different places to stay while in Venice that it can be tricky to know where to choose. There are apartments overlooking the canal that are perfect for longer visits but, for a weekend of unbridled decadence, why not choose a more luxurious and romantic option. For a start, it is time to dispel the myth that Venice is not a good summer destination. In fact, if you are clever about it, an early summer jaunt will ensure you get a good tan without baking. If you choos the luxury route, why not book a three or four-night stay splitting the break into two-nights at either The Gritti Palace or the Danieli in the centre of Venice followed by two nights across the lagoon on San Clemente Island at the beautiful San Clemente Palace Hotel. While the Gritti and Danieli, both Luxury Collection Hotels, are Venetian institutions, centrally located and beautifully maintained, San Clemente is a few minutes by motorboat from St Mark’s Square across the lagoon and ensures private luxury, complete with a swimming pool, tennis courts and spa. So you can leave Venice relaxed and suntanned as well as seeing all the sights. Poised on the Grand Canal, The Hotel Gritti Palace was commissioned in 1525 as the residence of the Doge of Venice and was since used as the official residence of the Vatican’s ambassadors to Venice. Luckily for visitors to the city today, the palace has been converted into a 91-room hotel with individually designed rooms and nine remarkable suites – the Hemingway being the most opulent. Perfectly located among the designer shops and a short stroll from St Mark’s Square, the palace is the perfect place to experience classic, old-world Venice. 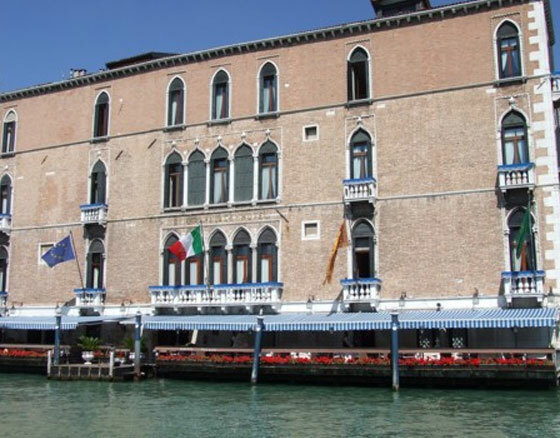 Despite being famous within Venice, the hotel remains relaxed, with personal touches, no pretention, friendly staff and the feeling that you are the only guests. Take time to sit down to lunch on the terrace of The Club del Doge restaurant and choose any of the pasta dishes while watching the world go by – by boat, that is.